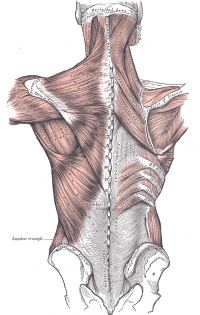 1.2 Understanding anatomy will help you to understand how to care for your back. 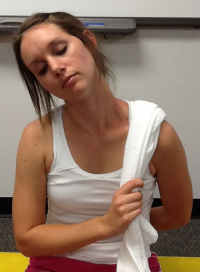 2.1 How common is neck pain? 3 Why Does My Back hurt? 4 What can I do about my Low Back Pain? 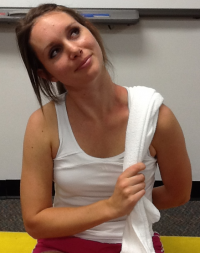 5 What can I do about my Neck Pain? 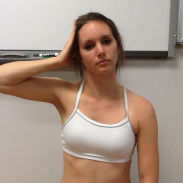 5.6 What does the literature say about neck pain? 5.7 Don't forget the thoracic spine! 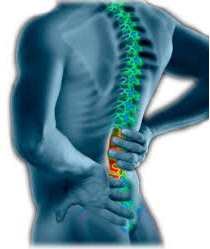 Each year, approximately $26 billion dollars are spent in the United States for the treatment of low back pain. Is pain always bad? No. Pain is the body's way to receive messages that there is a threat or something is wrong. Your brain processes this pain message and responds in a way that will reduce the threat. Initially, when tissues were injured, the nerves in your back (which have sensors) sent messages of pain to the brain. The brain, very much like a processor in a computer, takes this message or code and decides where it should be stored and which systems should deal with it. Those systems in the brain then send messages back through nerve pathways to the muscles to tell them to move the back gently and carefully so those tissues can heal. It is an amazing system in the brain, influenced by chemicals and the manner in which the pain messages are routed or circuited. Over time tissues heal and the healing process begins immediately. Usually within two weeks any swelling that caused the sensors to light up and send pain messages to your brain has gone away. Most tissues heal completely within four to six weeks. The brain can be sensitized or desensitized by several things including our beliefs about pain and our understanding of how the body heals. You may have heard stories about how soldiers in war times have stated they felt no pain even with limb amputation. All they remembered feeling was joy, knowing they weren't dead and would get to go home. This is an example of how the brain can interpret pain and desensitize the response It can be sensitized or over-reactive by our emotions, events that occur in our lives that may increase feelings of anxiousness or fear. The amount of pain you are feeling doesn't equal the amount of tissue damage you may have. In fact your tissues may have healed completely but you are still experiencing pain. The good news is that these processes are normal and there are things that can help you calm the nerves down that are sensitized or on call. Understanding anatomy will help you to understand how to care for your back. Your spine is wonderfully designed to allow you to move. It is also designed to help you absorb and distribute forces from the many activities you do. Your spine is made up of 33 small bones called vertebrae. Together, they form what is know as the vertebral column. There are 7 vertebrae in the cervical region which is your neck; 12 vertebrae in the thoracic region which is your upper back; 5 vertebrae in your lumbar spine which is your lower back; and 5 sacral vertebrae and 4 coccyx which are located below that. 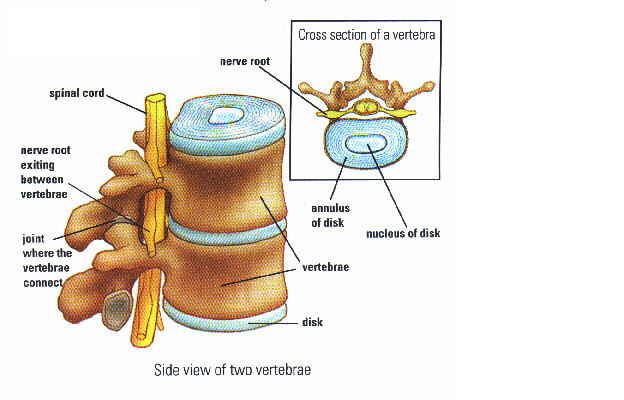 Between each of the vertebrae is a disc that binds the vertebra together like a very strong ligament. It acts as a cushion and a shock absorber. These intervertebral discs are made up of two parts-- the nucleus pulposus and the annulus fibrosis. The nucleus pulposus is in the middle of the disc and is jelly-like due to its large water content; it is composed of up to 80% water! The annulus fibrosis surrounds this nucleus and so forms the outer part of the disc. These discs play an important role in keeping the back healthy! Your spine has three natural curves that begin to develop from the moment a baby lifts his/her head and gravity begins to work on the body. The curves keep the spine from being completely rigid and help the spine to tolerate a little bit more compression. To understand the normal curves of a spine, there are 2 terms you need to know—lordosis and kyphosis. 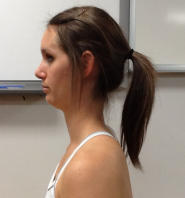 Lordosis is when the spine curves inward and a kyphosis is when the spine curves outward. The cervical portion of the spine is in a lordosis, the thoracic portion is in a kyphosis, and the lumbar spine is in a lordosis. These nice curves of the back increase the load bearing capacity of the spine. The spine has 4 main motions—forward bending, backward bending, sidebending, and rotation. These motions can also be coupled. For instance, you can have forward bending with rotation or backward bending with sidebending. 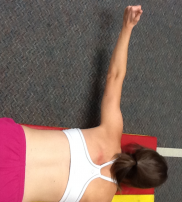 Below, we demonstrate these motions and report typical lumbar spine active range of motion. 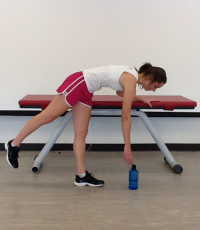 Many muscles work together to help make these spinal motions possible! These back muscles can be classified into three different layers-- superficial, intermediate, and deep. The muscles produce spinal movements and also help to keep the spine stable. In order to keep these muscles healthy, we must stay active. Just as with low back pain, it is important to understand the anatomy behind your neck pain! The neck is anatomically separated into the upper cervical spine and the lower cervical spine. There are 7 vertebrae that make up the cervical spine. The first cervical vertebra (C1) is called the Atlas. It has no vertebral body or spinous process. This vertebra articulates with the Occiput, which is the base of the skull. This articulation is labeled as the OA joint; its primary motion is flexion and extension at the joint. It also performing side-bending with opposite rotation. The second cervical vertebra (C2) is called the Axis; it has a large spinous process. The articulation between the Atlas and Axis is called the AA joint and its primary motion is rotation. 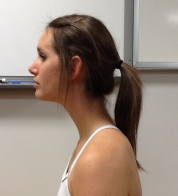 The following pictures demonstrate the motions of the lower cervical spine (C3-C7) and report the typical active range of motion. The muscle mentioned in the section About Back Pain also can play a role in neck pain, especially those muscles of the superficial layer. Also, deep inside the back of the neck are four important muscles called the suboccipital muscles. Back pain is becoming increasingly prevalent in our population. Pain is an indication that your body is working to protect that part of the body. Pain can be a good guide to the best healing behaviors; understanding pain can help you to deal with it effectively. Back pain can be caused by a multitude of structures, but the exact structure causing the pain cannot be identified. This is most likely because of the complex interactions of the brain and spinal nerves often times referred to as the Pain Matrix. Any structure in your back that has a nerve supply can send messages to the brain if it is injured. Back pain can come from the disc, facet joint, spinal nerve root, ligaments, muscles, bones, fascia or neurogenic claudication. The natural lordotic posture decreases the pressure on the disc compared to the straight posture which can put pressure on the disc and can push fluid from the nucleus pulposus into the vertebral body (schmorl’s nodes). It is important to differentiate herniated disc (space occupying) which refers into the leg vs other conditions (inflammation reaction, spasms, strains, facet syndrome) which are more localized in pain. Occurs when someone is in extension, or leaning backward, which puts pressure on the anterior/front of the disc causing it to herniated/prolapse/bulge. This can put pressure on nerves in the lower abdomen causing weakness or numbness, anterior longitudinal ligament, vertebral body, and transverse abdominus which can all cause pain. Occurs when some is in flexion, leaning forward, which puts pressure on the posterior/back of the disc causing it to herniate/prolapse/bulge. Stanton et al created a treatment based classification based system for low back pain. 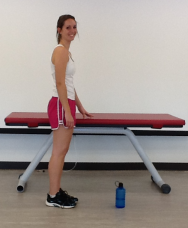 Exercise is a significant factor in the rehabilitation process. Studies have found that exercise is more effective at improving function and decreasing pain than seeing a family physician. Goal of exercises: to restore strength and endurance of the Transverse Abdominus and Lumbar Multifidus. Plan Your Lift: Know how heavy the object is. Clear a path and know where you are going with the object. Lift Close to your body: This will make you stronger and more stable. Make sure you have a firm hold on the object and balance it close to the body. Feet shoulder width apart: This allows for a solid base of support. Bend your knees while keeping your back straight: Avoid any twisting motions. 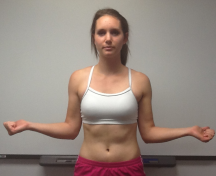 Tighten your stomach muscles: This will hold your back in good alignment and prevent excessive force on the spine. Avoid holding your breath. Lift with your legs: Your leg muscles are stronger than your back so use them. If you are straining, get help: Get help if the object is too heavy or you are in an awkward position. Avoid putting all of your weight onto one leg while standing. Benefits of exercise are improved joint health due to low impact exercises, increase bone density due to weight bearing exercises, improving energy, reducing health risks, improving circulation, and reducing stress and improving your mood. Aerobic activity is equally effective at reconditioning muscles as exercise and can also help in decreasing pain, improving your mood, and improving your functional capabilities. Lack of exercise increases your risk of obesity and other co-morbidities increases; this can lead to increased pressure on the spine and decreased flexibility. 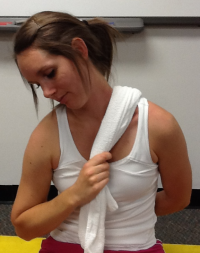 What does the literature say about neck pain? Don't forget the thoracic spine! If a patient demonstrates 3 of the 6 variables the chance of experiencing a successful outcome improves from 54% to 86%. If a patient has 4 of the 6 variables the chance of a successful outcome rises to 95%. ↑ Cynergy Physical Therapy. Back Pain. http://www.cynergypt.com (assessed September 23 2013). ↑ 2.0 2.1 2.2 2.3 2.4 2.5 2.6 Olson, KA. Manual Physical Therapy of the Spine. St. Louis, MO: Saunders; 2009. ↑ Physicians Plus.Vertebrae. http://www.physiciansplus.net (accessed September 16 2013). ↑ 4.0 4.1 Tank P. Grant's Dissector. 15th ed. Little Rock, AR: Wolters Kluwer; 2013. ↑ Ahern Family Chiropractic. Seizures. http://ahernfamilychiro.com (accessed September 24 2013). ↑ Butler D, Moseley. Explain Pain. Adelaide City Way, SA: Noigroup Publications; 2003. ↑ 8.0 8.1 8.2 Neumann, DA. Kinesiology of the Musculoskeletal System: Foundations for Rehabilitation 2nd Edition. St. Louis, MO: Mosby Inc; 2010. ↑ Stanton T et al. Evaluation of a Treatment-Based Classification Algorithm for Low Back Pain: A Cross-Sectional Study. Physical Therapy. 2011; 91:496-509. ↑ Hettinga et al. A systematic review and synthesis of higher quality evidence of the effectiveness of exercise interventions for non-specific low back pain of at least 6 weeks' duration. Physical Therapy Reviews [serial online]. September 2007;12(3):221-232. Available from: CINAHL with Full Text, Ipswich, MA. Accessed October 6, 2013. ↑ Browder D, Childs J, Cleland J, Fritz J. Effectiveness of an Extension-Oriented Treatment Approach in a Subgroup of Subjects with Low Back Pain: A Randomized Clinical Trial. Physical Therapy. 2007; 87: 1608-1617. ↑ Thompson WR, Gordon NF, Pescatello LS, eds. ACSM's Guidelines for Exercise Testing and Prescription. 8th ed. Baltimore: American College of Sports Medicine; 2010. ↑ Hettinga D, Jackson A, Moffett J, May S, Mercer C, Woby S. A systematic review and synthesis of higher quality evidence of the effectiveness of exercise interventions for non-specific low back pain of at least 6 weeks' duration. Physical Therapy Reviews [serial online]. September 2007;12(3):221-232. Available from: CINAHL with Full Text, Ipswich, MA. Accessed October 6, 2013. ↑ Cleland et al. Development of a Clinical Prediction Rule for Guiding Treatment of a Subgroup of Patients with Neck Pain: Use of Thoracic Spine Manipulation, Exercise, and Patient Education. Phys Ther. 2007; 87: 9-23.